Either in the studio or on the stage this upfront ribbon favours loud and proud instruments. Reduced proximity effect. Rocks on a guitar amp. Lightside/darkside offset ribbon design. Mid hump can sometimes mask the high-end. 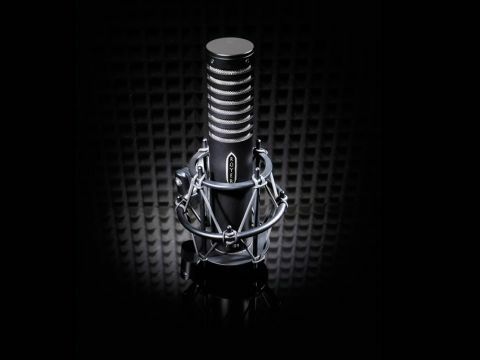 Royer Labs have created the R-101 to package up the prime characteristics of their R series mics for a (slightly) smaller budget. The R-101 is the largest of the range and presents a simpler, chunkier aesthetic in matte black. It's relatively light and, even with the included shock mount, doesn't require anything beyond a standard boom stand. Like all cradle shock mounted mics the R-101 may not be able to reach the places where end address mics can, but it easily nuzzles up to within 25mm of a guitar amp grill. This, of course, requires some hefty SPL handling and here the R-101 is no lightweight, with a rated 135dB at 30Hz maximum. Though new high SPL handling ribbon mics have become regularly used as close mics, they still exhibit proximity effect which can necessitate a low-cut EQ. Accordingly, the R-101 has been designed for a reduced proximity effect by way of the shock mounting system. The patented Royer offset ribbon design is used, creating a shift between front and back frequency responses: a dark side and light side respectively. The R-101 produces a healthy output very close to that of the R-121, which easily captures relatively quiet acoustic instruments without inducing too much preamp noise. If judged by the frequency response charts (never a good idea) you'd assume the R-101 is flatter and less bright than the R-121, but as ever the chart and the ears don't agree. The most audible characteristic of the R-101 frequency response is a mid lift centred around 2-3kHz. In some uses this can tend towards brashness, as we found when used as drum overheads, but on a guitar amp it aids a full and upfront tone. In this role the reduced proximity effect is (comparatively) noticeable and makes low cut EQ less likely. Though we didn't get a chance to record brass instruments with the R-101 it displays a mid frequency response close to an old Reslo mic we love in this role, though the Royer has a much higher output (i.e. less noisy) and a fuller low end. The high end roll-off is similar to the R-121, though the mid hump can slightly mask the highs (dependent on the source). Despite finding it a little harsh as a drum overhead there's plenty of low end for the kick and it picks out the snare very well (the flip side of a mid hump). For drums we found it works well closer to the floor, pointing at the kick drum. Ribbon mic competition is getting stiff, especially in the sub-£1k bracket so the R-101 has to trade on something more than its name badge. It offers something unique in the studio and on stage with its combination of reduced proximity effect and high SPL handling, definitely steering it towards the guitar and brass applications Royer highlight in their literature. If you add in the lifetime guarantee, free first re-ribboning, the quality shock mount and the overall workmanship then it could be seen as a safer bet than many. If the recording roles we have illustrated in this review are your bag then we'd recommend getting a trial with one of these to see if it has a place in your mic collection.